Centrifugal Separations in Molecular and Cell Biology focuses on the application of modern centrifugation technology in molecular and cell biology, including the separation and fractionation of biological particles by centrifugation on the preparative and analytical scales. The selection first covers the principles and practices of centrifugation and the bases of centrifugal separations. Discussions focus on the basic concepts of sedimentation theory, centrifugation methods, designing centrifugation experiments, care of centrifuges and rotors, and statistical estimation of molecular parameters. 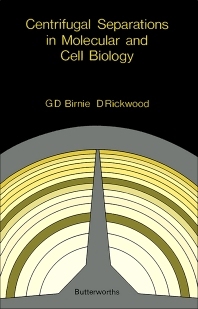 The book also ponders on the practical aspects of rate-zonal centrifugation, including gradient materials, density and viscosity of glycerol solutions, and resolution and gradient shape. The publication examines fractionations in zonal rotors and the quantitative aspects of rate-zonal centrifugation. The text then reviews isopycnic centrifugation in ionic media and analytical centrifugation. Topics include separation by isopycnic banding, large-scale preparative procedures, and density-gradient solutes. The selection is a valuable reference for readers interested in centrifugation technology.